So exciting news yesterday!!! We've told you that Cadsawan Jewelry is planning a treasure hunt, and now we've got a little more information on how, when and where. This fall, I’m going to go out of my comfort zone to have a treasure hunt for Vampire Academy, which will entail blogging, twittering, FBing and all sorts of things that deal in the 2D world. There will be more than just jewelry in the treasure. I have some fun swag that I will be posting frequently until the start of the contest, which is just one weekend: November 5, 6 & 7th. There will we a treasure map with ten clues, naturally related to Vampire Academy. When you've answered the questions, you'll be able to dig for the treasure. To take part in the treasure hunt, you have to follow Cadsawan Jewelry on Facebook and Twitter. There you will also get the clues on where to go to find the treasure. Janet has started a discussion topic about the treasure hunt on her Facebook page. So if you have any questions about it, you can ask her directly there. 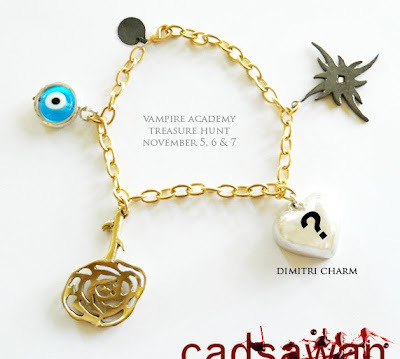 On a sidenote, Cadsawan Jewelry are having a a sample sale right now, and they're planning an entire section for this in the future. Click here to read more. Also, don't forget that Richelle's discount code for 15% off (RMVA15) is good throughout the month of October. Janet mentioned as well, that you can now buy single charms from the site, if you prefer that.